In this episode of specs comparison, we will be checking out two new smartphones under Php15k that have many similarities in key features. Which smartphone do you think has the edge over the other? Find out below! The Infinix Zero 5 was released last year and is now available in the country. It has a 5.98″ 16:9 FHD IPS display with 1080 x 1920 resolution, a MediaTek Helio P25 processor, a 6GB RAM, a 64GB internal storage, a 12MP + 13MP dual rear cameras with dual-tone LED flash, a 16MP front camera with LED flash, and a 4,350mAh battery with fast charging. The Doogee Mix 2 is an upgrade to the Mix and is now available in the country as well. 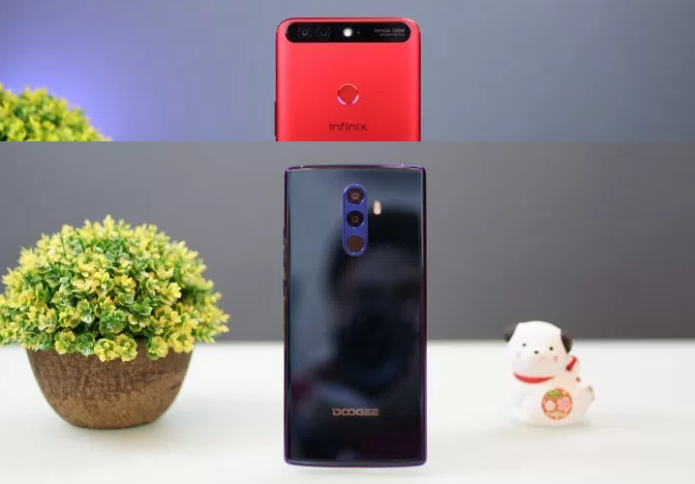 It has a 6″ 18:9 FHD+ display with 2160 x 1080 resolution, a MediaTek Helio P25 processor, a 6GB RAM, a 64GB internal storage, a 16MP + 13MP rear cameras with LED flash, an 8MP + 8MP wide-angle front camera, and a 4,060mAh battery with fast charging. There is a major difference between the display specs of the smartphones. The Zero 5 has a 16:9 screen aspect ratio while the Mix 2 has an 18:9 one that gives a higher vertical screen resolution. In terms of viewing experience, both have excellent screen displays, however, the latter gives more display to watch on. Their CPU and GPU are the same which mean that they have an almost the same performance and gaming potential. The Helio P25 has a 16nm architecture which means that it has an efficient and optimized chipset with good heat management. The Mali-T880 MP2 GPU can run games with heavy graphics to a certain extent. The Zero 5 and Mix 2 have dual rear camera setups in. The former has a 2x optical zoom and dual-tone LED flash while the latter has a higher main rear camera resolution. Moving to their front cameras, the former has a single front camera while the latter has a dual-lens setup both with a wide-angle feature. Another thing to note is that the Mix 2 has a face unlock feature that has been rising in popularity since last year. Their battery capacities do not have much difference. The Zero 5 has a slightly higher one but given that they have the same chipset, it is high-likely that their battery life will be near to each other. Both devices have fast charging tech so users don’t need to be wary about charging for a long while. In summary, it’s a win-win situation for these devices since they both have promising specs. The Mix 2 has a slight edge in terms of viewing experience and face unlock feature while the Zero 5 has the advantage of having a dedicated microSD card slot.